Slavkov was first mentioned in 1237 as a stronghold of the Order of Teutonic Knights. Parts of a residential building, along with a circular tower staircase, are preserved under the north wing of the Baroque chateau and the chateau courtyard. In the late 16th century, a Renaissance palace on a four-wing ground plan with arcades and a mighty prismatic tower were constructed on the older foundations. Fragments of the foundation masonry occur in the basement of the north and west wings of the chateau. 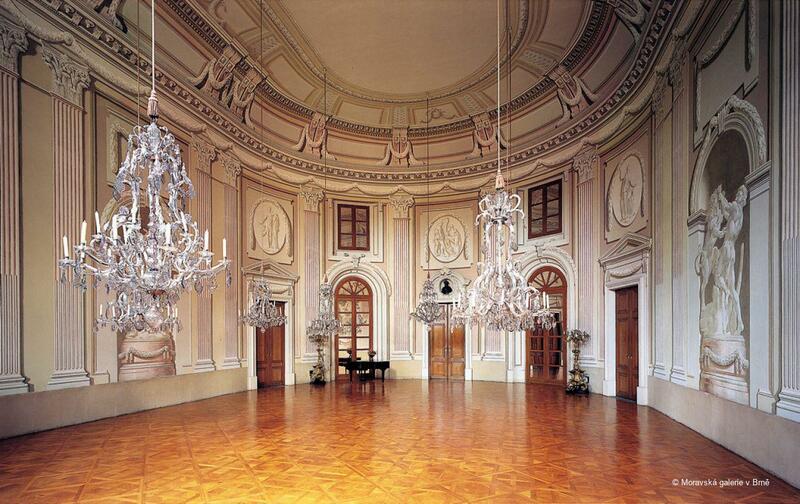 Baroque reconstruction took place in several stages determined by the social status of the investors. The three-wing, single-floor chateau is the dominant feature of the town. 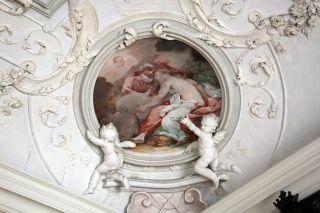 The two-storey Chapel of the Holy Cross was the last part of the chateau to be completed in 1769 (the paintings are by J. Pichler, monumental statues of angels F. X. Messerschmidt, 1774). The Imperial Chancellor V. A. Kounic-Rietberg is buried in the burial chapel on the cemetery. 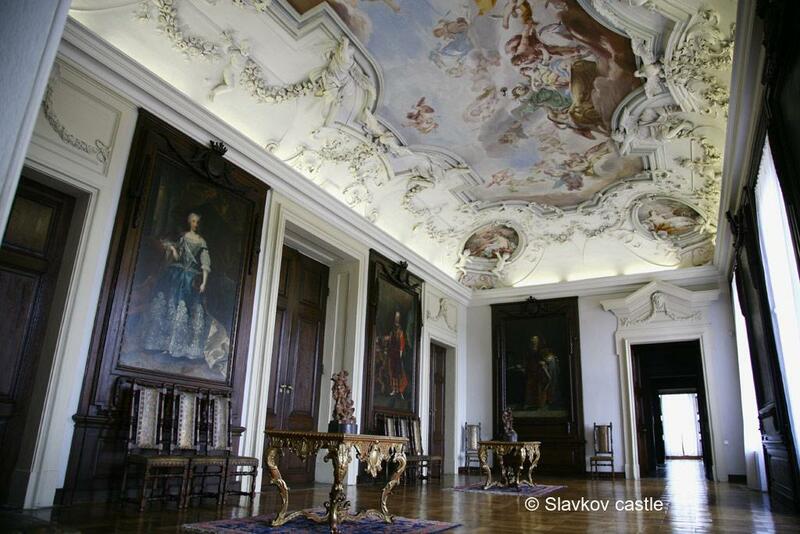 Slavkov, one of the oldest preserved aristocratic residences in Moravia, is a spectacular reconstruction of a Renaissance palace built for the Kounic family. 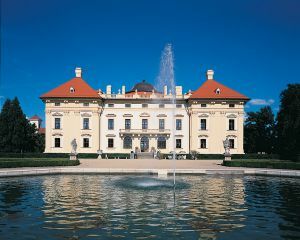 Building was started by Dominik Ondřej of Kounice, Imperial Vice-Chancellor, who commissioned the Bavarian architect, Zuccali, and later D. Martinelli. The plans included a new parish church for the town. 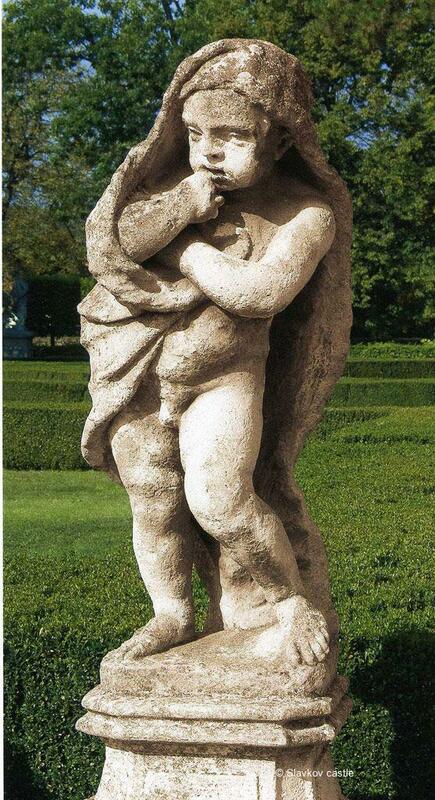 The original design was executed in a more austere manner and elaborated in the French style. 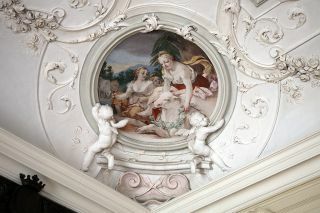 The chateau was decorated by Italian–Viennese artists. 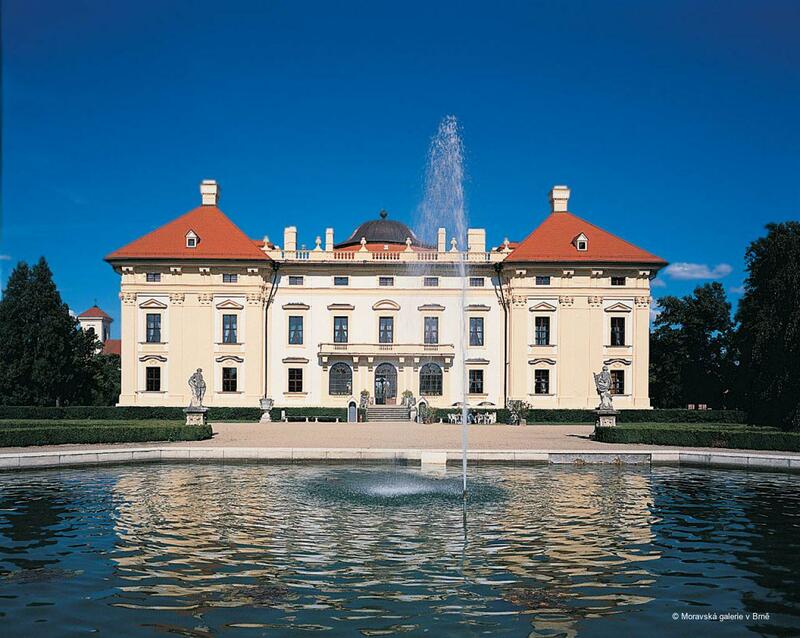 After the Battle of Austerlitz, a truce between Austria and France was signed in the chateau. 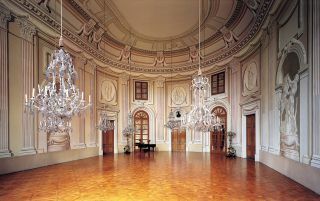 Reconstruction designs have been preserved in Lucca and Milan. Individual building phases can be determined on the basis of archive documents (chiefly correspondence). The spur for the spectacular reconstruction of a Renaissance palace for the Kounic family came from Dominik Ondřej of Kounice, Imperial Vice-Chancellor. Kounic first commissioned the Bavarian architect Zuccali and later D. Martinelli, who had worked for the family in other parts of the demesne (Uherský Brod). Only the west wing was completed. 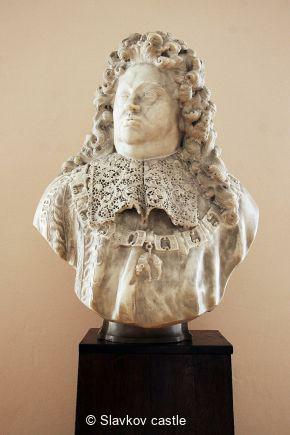 The bust was created by Jan Blommendael, portraitist of William III Oranje-Nassau (Mauritshuis). 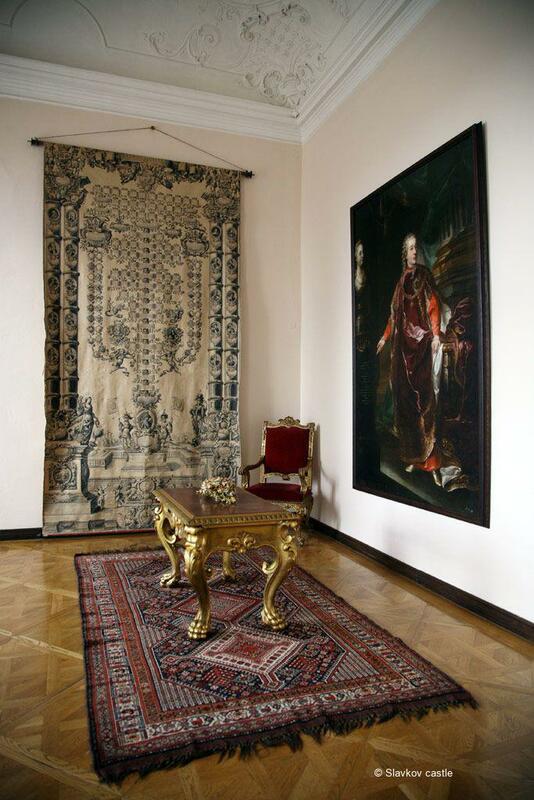 Kounic stayed in the Hague during the peace negotiations that took place between 1695 and1697. 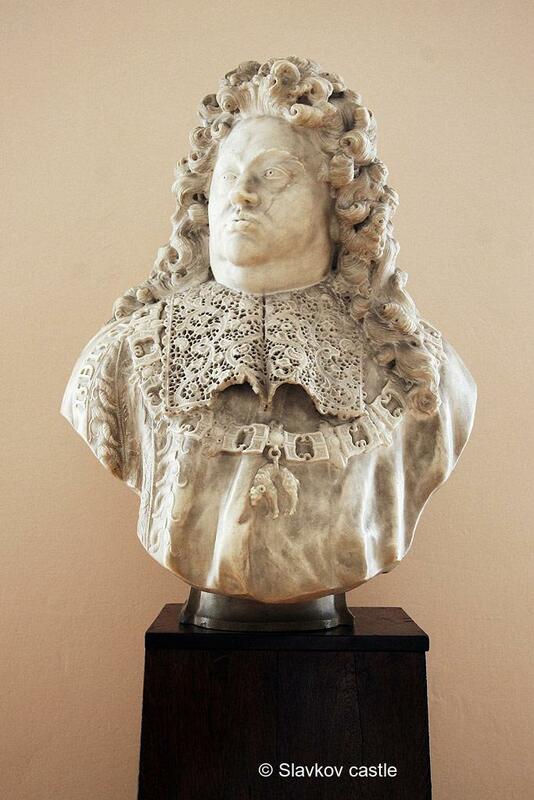 He was also portrayed by Hyacinth Rigaud. Martinelli’s design for reconstruction included the development of a major part of the town and a new parish church. The chateau, on a U-shaped ground plan with a ceremonial courtyard, reflected the status of the investor who thus laid the foundations for the future ambitions of the dynasty. 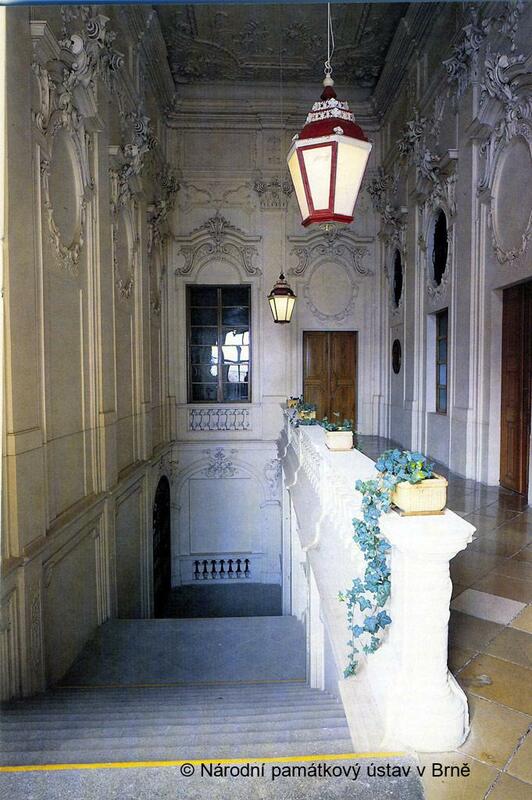 The building director, Petruzzi, adjusted the design to local conditions, paying attention in particular to new functions and taste in accordance with a design by I. Valmaggini, later a building director in Vienna. Maxmilián Kounic, son of Dominik Ondřej and Secretary to Charles VI as well as a secret councillor, became a provincial governor and preferred a more austere design in the French style. 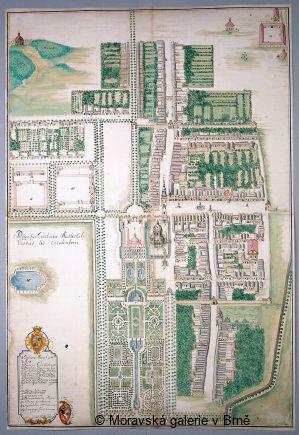 The design included the segmentation of the garden with pools, parterres and mazes. 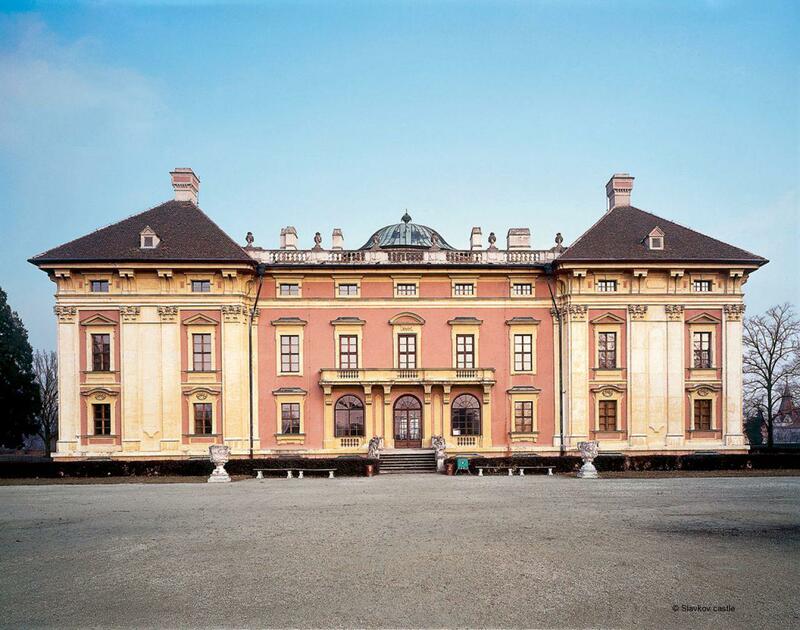 The Italian artists were part of the D. Martinelli circle, participating in the construction of the Liechtenstein palace in Vienna. The stucco artist, Bussi, also worked with Fischer von Erlach and J. L. Hildebrandt. Chancellor Václav Antonín completed reconstruction of a former garden room with a ceiling painting of the Gods on Mount Olympus and displayed larger-than-life portraits of his parents, grandparents and his wife. 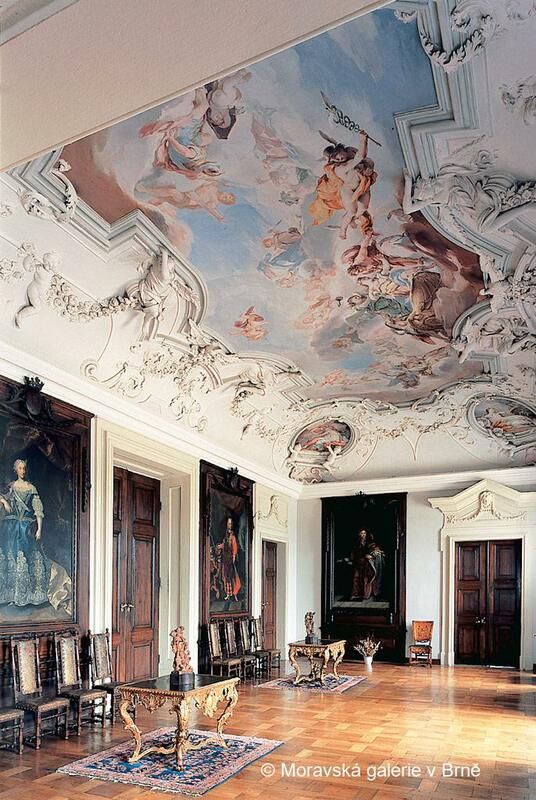 The Hall of the Ancestors is connected to the oval Historical Hall by illusionary painted architecture. 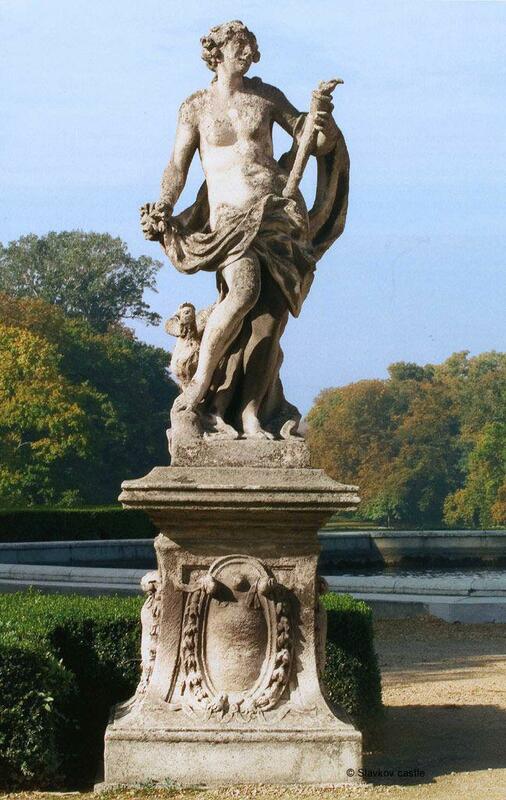 It was here that the truce between Austria and France was signed after the Battle of Austerlitz. 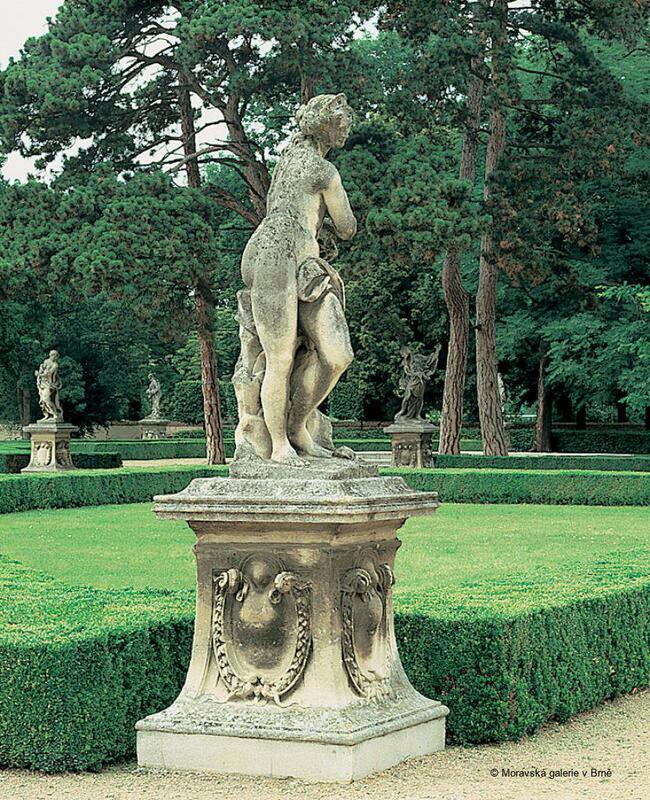 During the first stage of the construction of the chateau a park, in the style of French Baroque gardens, was taking shape outside the west wing under the guidance of Dutch experts. 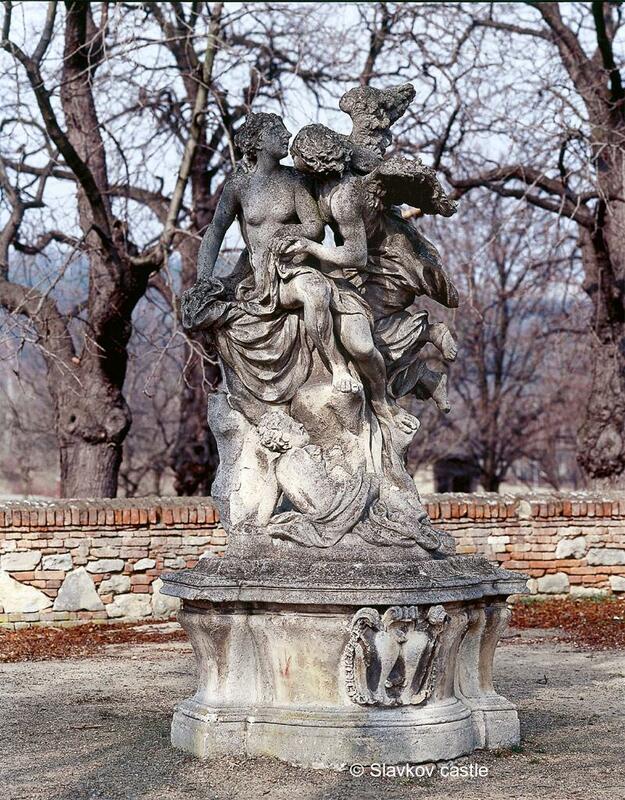 The garden casino with Lanzani’s decoration and a fountain by Peter Wiliame, has not survived and only the romantic Chinese pavilion from the 1780s remains. In the mid-19th century the garden, covering 15 hectares, was simplified in the “English” style. A reconstruction in the 1970s partially restored the Baroque appearance of the chateau parterre with pools and fountains and re-installed the mythological and allegorical stone figures. Miloš Stehlík, Slavkov u Brna, Brno, 1965. Jiří Kroupa, Václav Antonín kníže Kounic-Rietberg a jeho doba/Wenzel Anton Fürst Kaunitz-Rietberg und seine Zeit, Brno–Slavkov, 1994. Jiří Kroupa, in Jiří Kroupa (ed), Dans le miroir des ombres. La Moravie a la age baroque 1670–­­1790, Paris–­­ Rennes–­­Brno, 2002, pp. 136–137, cat. 28. Aleš Filip, V zámku a podzámčí. Barokní urbanismus na Moravě, in Tomáš Knoz (ed), Morava v době baroka, Brno, 2004, pp. 61–64. Luigi A. Ronzoni, Giovanni Giuliani, Johann Kräftner (ed)., München 2005, I, s. 27–37. Radka Miltová, Bůh Harpokratés, alegorie mlčenlivosti a Slavkov u Brna, in: Lubomír Konečný – Jiří Kroupa – Michaela Šeferisová-Loudová, Orbis Artium. K jubileu Lubomíra Slavíčka, Brno 2009, pp. 287–298. Copyright image "Národní památkový ústav v Brně": Národní památkový ústav – územní odborné pracoviště v Brně".